The story of history's greatest military operation and the commanders who nearly led it to success . . . 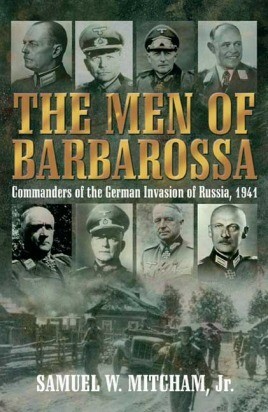 This book not only tells the story of Operation Barbarossa but describes the expertise, skills, and decision-making powers of the men who directed it. The result is an illuminating look at the personalities behind the carnage, as summer triumph turned to winter crisis, including new insights into the invasion's many tactical successes, as well as its ultimate failure. This objective is massive in scope, because Operation Barbarossa, the German invasion of the Soviet Union, was massive in scale, arguably the largest military operation of all time. In the single Battle of Kiev, for example, the Red Army lost over 600,000 prisoners, and twice as many men killed as the United States lost in the entire Vietnam War. The campaign also changed the world forever. Before Barbarossa, Hitler's Wehrmacht seemed invincible, like an unstoppable force of nature. No one, it seemed, could check the Führer's ambitions, much less defeat him. (The Battle of Britain, of course, was seen as a defeat for the Luftwaffe rather than the Wehrmacht. The German Army was still undefeated, and it was by no means clear in the spring of 1941 that German pilots would not yet finish off the United Kingdom.) Barbarossa changed all of that. By the end of 1941, Allied victory seemed to be a very real possibility. Few would have bet on it 16 or 17 months earlier. Pitting Germany in total war against the Soviet Union on a 1,000-mile front, Operation Barbarossa was truly staggering in its magnitude. Wars, however, are not fought by numbers, they are fought by men. Very often, writers stereotype German officers into two categories: Prussian gentlemen or Nazi monsters. There were, of course, both—but there were also varying shades of gray. In this book we learn of the goats and heroes, famous commanders and undersung leaders, and about those who were willing to stand up to the Führer and those who subordinated themselves to his will. The result is a book that casts a fresh perspective on one of history's most crucial military campaigns. Samuel Mitcham is an internationally recognized authority on the Second World War and the German Army in particular. He is the author of over twenty books. A former Army helicopter pilot and company commander, he is a graduate of the U.S. Army's Command and General Staff College. XIV. What Happened to the Men of Barbarossa? "..."a must read" for Eastern Front fans, as well as anyone seeking to find out more about the titanic struggle between Hitler and Stalin that determined the outcome of World War II in Europe."